Copies of this report are available for $2.50 each, or $1.00 each for orders of 20 or more, from the Center for International Policy. Request copies by e-mail at cip@ciponline.org. This report is also available in Adobe Acrobat (.pdf) format. The "War on Drugs" meets the "War on Terror"
In 2000 – an age ago, in foreign-policy terms – U.S. involvement in war-torn Colombia was big news. The Clinton Administration moved through Congress a special aid bill just for Colombia and its neighbors. By the time President Clinton signed the controversial package into law in July, a profusion of front-page articles, op-eds, congressional floor speeches and television coverage had put Colombia near the top of Washington’s list of international priorities. A lot has happened since the 2000 debate. Fighting between the government, two leftist guerrilla groups and right-wing paramilitaries worsened, killing about 4,000 people and forcing over 350,000 from their homes last year. The Colombian government’s attempts to negotiate peace with guerrilla groups came to a crashing halt in February 2002. Three months later, Colombians elected Álvaro Uribe, a hard-line president who promised to put the country on a total-war footing. Drug production continued to explode. The human rights situation worsened. "Democracy, the rule of law, economic stability and human rights" have eroded further. An observer in the United States would have had to watch Colombia closely, though, to notice most of these sour developments. Colombia has received much less attention from the Bush Administration and the U.S. media lately, especially since September 11, 2001. That terrible day, Colin Powell was to pay his first visit to Bogotá as secretary of state. He would not set foot in Colombia for another fifteen months, when he arrived for a twenty-two hour stay in December 2002. A country that Gen. McCaffrey described three years ago as "out of control, a flipping nightmare" has been eclipsed by higher-priority "war on terror" countries, and by the administration’s charge toward war in Iraq. Overall military and police aid amounts are increasing, with new Colombian units getting support to operate in new parts of the country. An August 2002 change in U.S. law has broadened the purpose of lethal assistance – for years limited to counter-narcotics – to include "counter-terrorism." The change allows U.S.-aided units to go on the offensive against the guerrillas of the Revolutionary Armed Forces of Colombia (FARC) and National Liberation Army (ELN), and the paramilitary United Self-Defense Forces of Colombia (AUC). U.S. Special Forces are now in Colombia training thousands of soldiers to guard an oil pipeline and to hunt insurgent leaders. Meanwhile, efforts to assist the conflict’s victims, build a functioning judicial system, and salvage Colombia’s rural economy are off to a shaky start. It is remotely possible that U.S. counter-terror aid and President Uribe’s draconian security policies could add up to a push strong enough to force the guerrillas and paramilitaries to collapse, like a house of cards. A more likely outcome is that these policies cause the war to grind on further and fail to hinder the drug trade, creating pressures for even more security assistance and perhaps a greater U.S. military role. U.S. policy toward Colombia needs to change before the crisis engulfs Colombia’s neighbors and other U.S. interests. Understanding what an alternative policy would look like requires a review of past failures and present dangers. Long before George W. Bush entered the White House, critics of the U.S. approach to Colombia contended that it was too focused on drug-war priorities and relied too heavily on the country’s troubled security forces. The policy, they argued, ignored the complicated, deep-rooted origins of Colombia’s conflict. Since 1999, U.S. aid has included eighty-four helicopters; the creation of new brigades in Colombia’s army and navy; grants of cargo and attack aircraft, patrol boats, communications and intelligence-gathering equipment, uniforms, and small arms; and the training of over 15,000 Colombian military and police (6,300 of them in 2001 alone). Hundreds of U.S. troops and private contract personnel work on Colombian soil as trainers, intelligence-gatherers, spray pilots and mechanics, among other duties. Since 1996, U.S. pilots on anti-drug missions have sprayed herbicides over more than a million acres of Colombian territory. 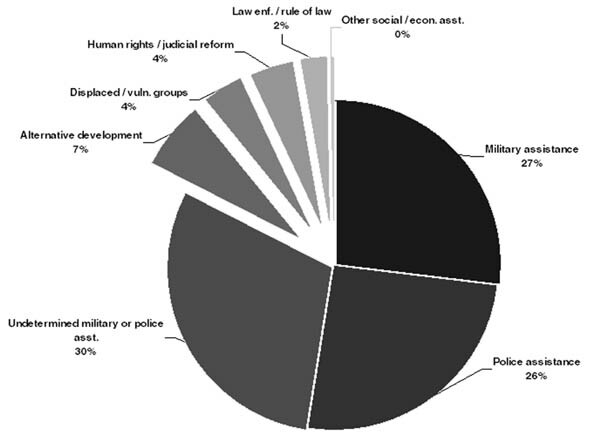 During most of the 1990s (until about 1999), Colombia’s National Police received nearly all lethal U.S. aid. Washington was wary of getting too deeply involved in the country’s conflict, and the early-90s effort to dismantle the Medellín and Cali cartels had forged a closer relationship with the police than with the armed forces, which were marred by allegations of corruption, human rights violations, and collusion with the rightist paramilitaries. The Clinton Administration nonetheless shifted the bulk of aid to the military in 1999 and 2000, arguing that the guerrillas’ and paramilitaries’ entry into the drug business made many counter-narcotics missions too dangerous for the police to perform alone. The DIRAN came under a cloud of scandal in 2002, when investigators revealed that several high-ranking officers had stolen at least $2 million in U.S. aid intended for administrative expenses. [11 ] Though investigations continue, the scandal forced the dismissal of twelve officers and the reassignment of DIRAN director Gen. Gustavo Socha. Colombia’s armed forces, especially its army, now receive most U.S. assistance. Since 1999 more than half of all aid to Colombia’s army has gone to create and maintain a new 2,300-man brigade. The "First Counter-Narcotics Brigade" operates in the departments (provinces) of Caquetá and Putumayo in Colombia’s far south. This Pennsylvania-sized zone, which accounts for over one-third of all coca (the plant used to make cocaine) grown in Colombia, is fiercely contested by the FARC – for whom it has been a key stronghold for decades – and the paramilitaries, who arrived in the late 1990s and now control most major towns. 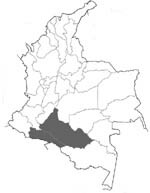 (For more information on this zone, see CIP’s April 2001 publication Plan Colombia’s “Ground Zero.”) The new army unit’s original mission was to attack drug-processing labs, to apprehend traffickers, and to clear armed groups from areas of drug-crop cultivation (or at least to clear them long enough for the U.S. herbicide spray planes to pass through). An August 2002 change in the law allows the Counter-Narcotics Brigade to use its equipment and training for "counter-terrorism" as well as anti-drug missions; as a result, some of the brigade’s operations may come to resemble the U.S.-supported counter-insurgency efforts commonplace in Latin America during the Cold War. Much additional aid has gone to Colombia’s Marine Corps (part of the Colombian Navy) to stop drug trafficking on the country’s thousands of miles of rivers. U.S. funding – most of it through the defense budget, not the foreign aid budget, an unusual move – helped create a Riverine Brigade, founded in 1999, with five battalions in some of the most conflictive parts of the country (Putumayo, Guaviare, Guainía, and the Magdalena Medio and Urabá regions). The five battalions will encompass fifty-eight individual "riverine combat elements" (RCEs), smaller units of four boats each, deployed in remote areas. As of September 2002, U.S. funding had helped create thirty-three RCEs. [14 ] Colombia’s Coast Guard has also received boats and training to stop maritime trafficking. "Light-infantry skills," the most frequent subject taught, make up much of the training offered to the Counter-Narcotics Brigade. The term refers to the tactics and capabilities necessary for small units to operate in difficult terrain, whether for counter-narcotics or counter-insurgency: marksmanship and weapons familiarization, ambush techniques, camouflage, communications, map and compass reading, and similar skills. The United States is also stepping up one of the most controversial types of assistance: intelligence. Colombia’s armed forces are getting more information than ever from U.S. communications intercepts, aircraft and satellite photography, and human sources. U.S. personnel are also offering their Colombian counterparts equipment and training to improve their own ability to collect and analyze intelligence. A classified Clinton Administration "Presidential Decision Directive," PDD-73, prohibited intelligence-sharing with the Colombian security forces unless specifically for counter-narcotics purposes. Pentagon officials told The Washington Times in February 2002 that the PDD-73 restrictions had them "frustrated and fuming. "[19 ] As of October 2002, the Clinton-era rule remained in effect, but a Bush Administration revision (now known as an NSPD, or National Security Presidential Directive), allowing the United States to share intelligence about guerrilla and paramilitary activity without regard to drugs, was nearing completion – and may now be in place. [20 ] As a result, the United States may share intelligence it gathers about non-drug threats, including such tactical information as insurgent groups’ movements and locations. About one in six dollars from "Plan Colombia" and subsequent aid packages has helped coca-growers switch to legal crops, offered emergency assistance for people displaced by the conflict, aided the judiciary and the prosecutor’s office, provided protection for governmental and non-governmental human rights workers, and assisted demobilized child combatants. "This bill makes it clear that we have not forgotten the poorest people in Colombia," said Sen. Richard Durbin (D-Illinois) during the 2000 Plan Colombia debate. Yet the U.S. approach to Colombia appears to neglect even these basic tenets of counter-insurgency. Massive aerial herbicide fumigation is fueling anti-government sentiment in a guerrilla-controlled area. The social and economic component of Washington’s aid has been overshadowed, particularly in most Colombians’ perceptions, by the far larger military-aid outlay. It has also suffered from very serious implementation problems. Some aid programs, particularly emergency humanitarian assistance, appear to be reaching target populations – though, as U.S. Ambassador to Colombia Anne Patterson admits, they "represent a drop in the bucket in relation to the real needs of Colombia’s displaced persons. "[24 ] But other crucial efforts have struggled in the face of bureaucratic obstacles, the Colombian government’s institutional shortcomings, and a tendency to exclude local governments, non-governmental organizations and communities on the receiving end. An alternative-development scheme in Putumayo – the epicenter of expanded fumigation – has virtually collapsed. Aid for judicial reforms lags badly behind as well; in September 2002 – two years after the "Plan Colombia" appropriation – the House Appropriations Committee reported that more than half of such funds remained unspent. [25 ] The troubling outcome is that thousands of people directly impacted by U.S. military programs have not been reached by the economic aid that was supposed to accompany them. Even as military-aid deliveries were just getting underway, though, the U.S. and Colombian governments significantly expanded herbicide fumigation in and around Putumayo, where the Plan Colombia-supported brigade operates. Increasing spraying in this zone was a key objective of the so-called "push into southern Colombia," the name that the 2000 package’s designers gave to their aid for the new brigade and related units. 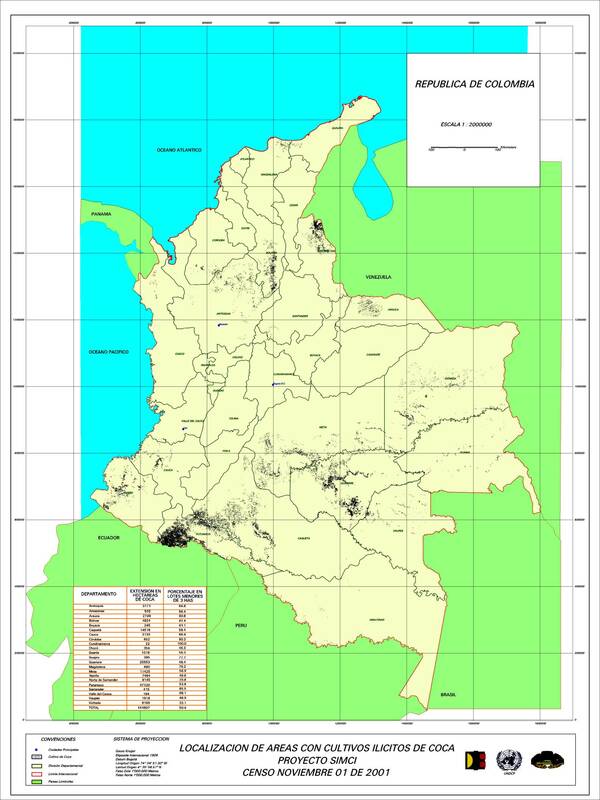 A first round of spraying in Putumayo fumigated 25,000 hectares between December 2000 and February 2001, even before the Counter-Narcotics Brigade had all three of its component battalions. Above U.S. objections, the government of Andrés Pastrana suspended fumigation after this first round, in order to give Plan Colombia’s alternative development component a chance to take hold. [29 ] The effort to help coca-growing peasants adopt legal alternatives took the form of a series of "social pacts," in which signers would receive basic assistance, followed by technical and infrastructure support, in exchange for eradicating all their coca within twelve months after first receipt of aid. By July 2001, 37,000 families in Putumayo – just under half of the department’s population – had signed "pacts" and were awaiting assistance. The assistance failed to arrive. Alternative development money was delayed by bureaucracy, forced to pass through several agencies before reaching the peasants: the State Department’s Bureau for International Narcotics; the U.S. Agency for International Development (USAID); the Colombian government’s Plan Colombia implementing agency; the Colombian government’s alternative-development agency, PLANTE; and five Colombian non-profit organizations, with no previous ties to Putumayo, contracted to deliver the assistance. The security situation in Putumayo – which, despite the presence of two army brigades, a naval brigade, and police, is marked by constant territorial disputes between guerrillas and paramilitaries – slowed aid delivery further; the FARC killed two alternative-development workers in September 2001. Since the spraying was not accompanied by a credible alternative development effort in Putumayo, thousands of peasants who had their crops eradicated suddenly found themselves with no way to make a living. Putumayo community and church leaders interviewed by CIP in November 2002 spoke of a humanitarian disaster. Since spraying damaged food crops, they said, many families in FARC-controlled rural areas, unable to travel to paramilitary-controlled towns, were going hungry. Great numbers of people were leaving Putumayo, some across the border into Ecuador and others to plant coca elsewhere in the country. Young people, lacking other economic opportunities, were volunteering to join the FARC or the paramilitaries. USAID has not given up completely on rural Putumayo. Instead of blanketing the zone with "pacts," its contractor, Chemonics Inc., has inked several agreements with entire villages to deliver aid in exchange for immediate eradication. This model, however, has only reached a few thousand Putumayo residents. The rest – the tens of thousands whom Washington hopes will simply move elsewhere – will receive little more than herbicides. It is not unreasonable to imagine that many will grow coca elsewhere or make common cause with illegal armed groups. The U.S. Congress has not been blind to these risks. Members of both houses have voiced concern about the health, environmental and social impacts of fumigation. Legislators have also expressed doubts about the Colombian armed forces’ human rights record and the danger that U.S. assistance could indirectly contribute to abuses. Some worry about military over-commitment. As a result, foreign aid law includes several conditions and limitations on U.S. assistance to Colombia. These conditions have themselves become focal points of debate, as watchdog groups and some members of Congress have sharply criticized the administration’s claims to have met them. The 2002 foreign aid law (which remains in effect until Congress passes the 2003 law) sought to limit fumigation’s collateral effects. It prohibited new herbicide purchases until the State Department certified to Congress that (1) herbicide use was consistent with U.S. domestic regulations and posed no unreasonable health or environmental risks (a conclusion to be reached after consulting the Environmental Protection Agency, the Department of Agriculture and the Centers for Disease Control); (2) procedures were available to compensate people whose health or legal crops were damaged by fumigation; and (3) alternative-development programs were functioning in areas where spraying is to take place. According to the civilian director of the Human Rights Unit of the Prosecutor Generals Office, the Colombian Armed Forces  in accordance with Colombian law and practice  are suspending ... military personnel alleged to have committed gross violations of human rights or to have aided or abetted paramilitary groups. There is no evidence to show that the Commander General of the Colombian Armed Forces is exercising the power held by this office to suspend high-ranking officers. To the contrary, our evidence shows that these officers remain on active duty and in command of troops. During the administration of former President Pastrana there was a steady improvement in Colombian Armed Forces cooperation with civilian authorities in the investigation, prosecution, and punishment in civilian courts of military personnel credibly alleged to have committed gross violations of human rights or to have aided and abetted paramilitary groups. Colombia's armed forces continue to dispute the jurisdiction of cases involving the investigation and prosecution of alleged human rights violations by members of the military. This violates both Colombian law and a presidential directive issued by President Andrés Pastrana. The Colombian Armed Forces are taking effective action to sever links between military personnel and paramilitary units at the command, battalion and brigade levels. There is no evidence that the Colombian Armed Forces have arrested key paramilitary leaders or high-ranking members of the Armed Forces credibly alleged to have collaborated with paramilitary groups. "Members of the security forces sometimes illegally collaborated with paramilitary forces," acknowledged the State Department’s March 2002 human rights report. [47 ] Congress, concerned about this persistent pattern of indirect abuse, placed a human rights certification requirement in the 2002 foreign aid law. Unlike a similar provision in the 2000 "Plan Colombia" aid package, the 2002 law did not carry a waiver allowing the President to skip the restrictions for "national security" reasons. It also required the process to occur twice by withholding 40 percent of military aid for a second round of certifications. "Sooner or later," Ambassador Patterson warned in October 2002, "official Americans will be killed in Colombia carrying out their duties; when that happens, it will be big news. "[51 ] Congress has shared these concerns about proximity to Colombia’s conflict. The original 2000 "Plan Colombia" aid package law limited the U.S. presence in Colombia to a maximum of 500 military personnel and 300 U.S. citizen contractors; the 2002 foreign aid law changed the figures to 400 and 400. On November 13, 2002, the Bush Administration reported, 267 military personnel and 270 contractors were present in Colombia. The "cap" on contractors, meanwhile, only applies to U.S. citizens. Citizens of other countries working for U.S.-funded contractors – such as the foreign nationals employed by DynCorp, Inc. to co-pilot the Counter-Narcotics Brigade’s helicopters – are not included within the "contractor cap. "[54 ] As "Plan Colombia" gives way to "counter-terror" aid initiatives, the "troop cap" will become irrelevant if not amended. The White House does not appear to be progressing toward its goal of a 50 percent reduction in Colombian coca-growing by 2005. Coca is difficult to estimate – CIA figures made public in March 2002 showed a significant increase, while statistics from the UN Drug Control Program and the DANTI showed a reduction. 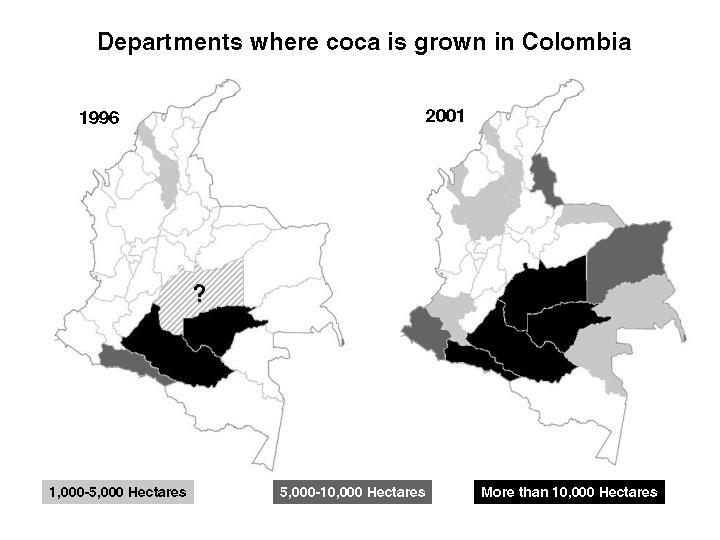 [56 ] Both sources seem to indicate, though, that the overall amount of coca grown in Colombia is somewhere near 150,000 hectares, or three times as much as it was when the United States began large-scale spraying in 1996. [The United States will release estimates of 2002 coca cultivation in early March 2003. Since satellite measurements will occur immediately following the July-October fumigation campaign in Putumayo, and may not take into account replanting and new planting elsewhere, the 2002 statistics may show a greater decrease than probably exists.] That year, only four (perhaps five) of Colombia’s thirty-two departments had 1,000 or more hectares of coca. In 2001, the UN/DANTI study found that much coca in thirteen departments. [57 ] Fumigation has proven able to reduce coca-growing in limited areas, but growers have been far more agile. New crops keep appearing in previously untouched parts of Colombia’s vast savannahs, jungles and even coffee-growing zones. Clinton and Bush Administration officials repeatedly argued that military training and engagement would ease Colombia’s human rights crisis and encourage the armed forces to end collaboration with paramilitary death squads. Sadly, the human rights situation shows no signs of improvement; in fact, it has worsened. The Consultancy for Human Rights and Displacement (CODHES), a widely cited Colombian non-governmental organization, estimated that violence forced 353,120 people from their homes during the first nine months of 2002, more than in all of 2001. [61 ] The Colombian Commission of Jurists reported in September 2002 that political violence was killing an average of twenty people per day, double what the CCJ was reporting in 1998. [62 ] Military-paramilitary linkages remain a huge problem: in January 2003, Human Rights Watch reported that "there were numerous and credible reports of joint military-paramilitary operations and the sharing of intelligence and propaganda" in 2002. Clinton Administration proponents of Plan Colombia also argued that the aid package would speed President Pastrana’s peace process with the FARC by forcing the guerrillas to negotiate "in good faith. "[64 ] The opposite happened: Plan Colombia gave the upper hand to hardliners on both sides, further polarizing an already difficult attempt at dialogue. On February 20, 2002, talks with the FARC collapsed, and a renewal seems highly unlikely in the near term. Plan Colombia’s architects also promised that they would achieve their goals without "mission creep." During the 2000 debate, U.S. officials assured skeptics that they had no interest in supporting an El Salvador-style counter-insurgency campaign against the FARC, ELN and AUC. Gen. Barry McCaffrey, the drug czar, stated the policy clearly in November 2000: "The primary focus of this supplemental effort is to provide support for Colombia’s intensifying counter drug effort. As a matter of Administration policy, the United States will not support Colombian counterinsurgency efforts." At the time, there was little debate over this point; the administration and Congress both saw drugs as the main U.S. interest, peace talks with the guerrillas were ongoing, and little appetite existed – beyond a few voices on the right – for a costly plunge into Colombia’s seemingly endless war. Washington endeavored to limit its aid to drug-war priorities by providing assistance only through counter-narcotics funding accounts, overwhelmingly favoring security-force units with counter-drug responsibilities, and building "firewalls" like PDD-73. Meanwhile, watchdog groups denounced any assistance that appeared to "cross the line" between the drug war and Colombia’s larger war. On a single September morning, however, the drug war was instantly eclipsed by a new overseas crusade: the global "war on terror." This eclipse was not total in Colombia, though, as the FARC, ELN and AUC are all on the State Department’s list of international terrorist organizations (with the AUC, ironically, added on September 10, 2001). For Bush Administration officials and their supporters in Congress, the two "wars" simply overlap. In Their Own Words: In the months after September 11, U.S. officials began comparing Colombias armed groups to international terrorist organizations with global reach, like Al Qaeda. The Revolutionary Armed Forces of Colombia (FARC), the National Liberation Army (ELN), and the United Self-Defense Forces of Colombia (AUC), are on the list because they participate in terrorist activities. They will receive the same treatment as any other terrorist group, in terms of our interest in pursuing them and putting an end to their terrorist activities. The advent of the "war on terror" has kept Washington from learning any lessons from its lack of results in Colombia. Instead, the military-dominated approach is intensifying. Even before September 11, 2001, the new Bush Administration had initiated a "review process" to explore the possibility of going beyond the drug war to help Colombia’s government fight the guerrillas and the paramilitaries. [66 ] In the wake of the tragedy, key officials and members of Congress began aggressively pushing to adopt a counter-terror stance. Comparisons between Colombian groups (usually the FARC) and al-Qaeda began to show up in the press with some regularity. The counter-terror mission’s proponents gained momentum after the Pastrana government’s peace talks with the FARC collapsed on February 20, 2002. On March 6, the House of Representatives passed a resolution calling on President Bush to submit legislation "to assist the Government of Colombia to protect its democracy from United States-designated foreign terrorist organizations" – in other words, to allow Colombia to use U.S. military aid in its war against the guerrillas and paramilitaries. "I think that these brigades that we’re talking about will be very offensively oriented," said Gen. Galen Jackman, the Southern Command’s director of operations. "That is focused the enemy, as opposed to a static defense around the pipeline." Ambassador Patterson told a Colombian newspaper that pipeline defense could be only a first step. "There are more than 300 strategic infrastructure points for the United States in Colombia. … But first we’ll see how this Caño Limón project goes." H.R. 4775 and the "unified campaign"
The importance of H.R. 4775 goes well beyond the pipeline plan. A single sentence in the bill laid the groundwork for a dramatic shift in U.S. policy. H.R. 4775 changed U.S. law to allow the Colombian government to use all past and present counter-drug aid – all the helicopters, weapons, brigades and other initiatives of the past several years – against the insurgents. The legislation calls this "a unified campaign against narcotics trafficking [and] against activities by organizations designated as terrorist organizations such as the Revolutionary Armed Forces of Colombia (FARC), the National Liberation Army (ELN), and the United Self-Defense Forces of Colombia (AUC)." Beyond the pipeline program, recent press reports indicate that Southern Command is about to help Colombia’s Army create a new commando unit. Jane’s explains, "The commando unit, to be modeled on a US Army Ranger battalion, will learn long-range tactical level reconnaissance and surveillance, and direct action focused on terrorist leaders. ... Troops have already been selected for the commando battalion and have begun preliminary training. The unit is set to be operational by the end of FY03 [Fiscal year 2003]." Meanwhile, the Bush Administration is deciding whether to seek a re-negotiation of its Forward Operating Locations (FOLs) – sections of airports or military bases in Ecuador (Manta), El Salvador (Comalapa), and the Netherlands Antilles (Aruba and Curacao). According to agreements signed with each country after the 1999 closure of Howard Air Force Base in Panama, U.S. military planes may use these installations for counter-drug or search-and-rescue missions only. Beyond these initiatives, it is not yet clear how U.S. activities will expand to match Washington’s much more ambitious mission in Colombia. While the purpose of U.S. military aid has expanded remarkably, we have not seen a similar expansion in the amount of U.S. assistance – at least not yet. Certainly, military aid is rising – Colombia’s security forces will get over $100 million more in 2003 than they did in 2002. The pipeline program accounts for most of that increase. Yet another $100 million would have only marginal impact on the direction of a conflict involving nearly 40,000 well-funded insurgents. Pressures for dramatically increased military assistance are likely to build up over the next year or two. With the mission far broader than the resources available, U.S. officials are likely to be frustrated by having to continue saying "no" to their Colombian military partners. Accumulated frustrations would likely motivate a new request to Congress for still more military hardware. The same dynamic of expanded mission, resource pressure, and escalating aid levels could play out for any other aspect of security assistance, from new brigades to the number of U.S. advisors. By any measure, then, the U.S. military commitment to Colombia is very likely to continue increasing. Preliminary reports about the United States’ 2004 foreign aid request to Congress – which could be issued as early as February 2003 – indicate that it may be at least $100 million higher than 2003 levels (and thus over $200 million higher than 2002). Beyond this, the crystal ball is hazy. Will military-aid levels grow to $1 billion or more by 2005? Will we see an increased U.S. military presence in Colombia to carry out this expanded mission? How much aid or U.S. involvement is enough to guarantee success? Does the United States even have a definition of what "success" would look like? It is difficult to answer these questions, because the Bush Administration is doing two contradictory things at the same time. Decisionmakers are expanding the U.S. security commitment to Colombia, even while they lower the country’s rank on their list of foreign policy priorities. Top policymakers, focused on Iraq, North Korea, and terrorist groups with "global reach," have not crafted a coherent strategy that reflects Colombia’s complicated challenges. Instead, they have opted for steady military-aid increases within the framework of a blanket "counter-terror" approach. A key danger of drifting into Colombia’s conflict under the banner of "counter-terrorism" is that U.S. policymakers may soon find that "counter-terrorism" and "counter-insurgency" are identical in Colombia. Unlike other second-tier "war on terror" countries like the Philippines, Georgia or Yemen, where the terrorist enemy is a shadowy group of a few dozen or a few hundred, Colombia’s three "terrorist" groups are real armies. They have tens of thousands of members, control significant amounts of territory, and have long histories. A "counter-terror" effort in Colombia, then, risks evolving into an El Salvador-style counter-insurgency campaign – complete with U.S. advisors accompanying combat operations (something they do not do now) – in a country fifty-three times larger than El Salvador, with eight times as many people. The human cost could be nightmarishly high as well. The El Salvador example is once again instructive. It took twelve years and nearly two billion dollars of military aid to achieve only a stalemate in El Salvador, after fighting killed 70,000 people and exiled over a million. A central goal of U.S. policy should be to avoid such a humanitarian disaster – especially on the scale of a country the size of Colombia. Central to avoiding further humanitarian disaster is avoiding any possibility that U.S. assistance could benefit paramilitaries, whether directly or indirectly. This will be harder to do as military assistance increases and broadens in scope. The 2003 foreign aid bill, still before Congress as this report goes to press, includes more than just pipeline-protection aid and counter-terrorism initiatives. The drug war still serves as the framework for most U.S. assistance to Colombia. If Congress grants President Bush his entire request, the 2003 bill would provide Colombia with $538 million in assistance, of which $383 million would go to the police and military. (An additional estimated $115 million in military aid would come through Defense Departments annual budget.) $155 million in economic and social assistance would go toward such programs as alternative development ($54.5 million), assistance to the displaced and other vulnerable groups ($45.5 million), support for democracy ($24 million) and protection of human rights workers, witnesses, prosecutors and judges ($2 million). It is probable, though not certain, that human rights and fumigation conditions will once again appear in the law. 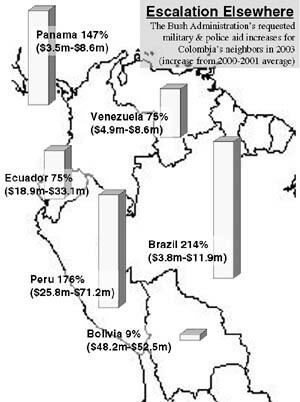 As in 2002, most of this assistance is part of the Andean Regional Initiative, the name that the Bush Administration has given its counter-drug assistance package to Colombia and six of its neighbors  Bolivia, Brazil, Ecuador, Panama, Peru and Venezuela  all of which would see military and police aid increases if the administrations request is fulfilled. While guerrilla brutality is worsening to sickening levels, the Colombian military’s toleration and abetting of paramilitaries also continues in much of the country. CIP staff visited eight departments of Colombia in 2001 and 2002; in each, we heard denunciations from local officials, labor leaders, human rights defenders, and church representatives of routine military-paramilitary cooperation, such as ignoring AUC roadblocks, vacating zones before paramilitary attacks, or soldiers and paramilitary thugs appearing together in public. As the U.S. aid mission expands, it remains to be seen whether existing legal safeguards will be enough to prevent our assistance from reaching unintended beneficiaries. In an unlikely but not impossible scenario, for instance, the United States might tell the Colombian military that guerrillas are in village X, only to see military personnel share this intelligence with paramilitaries who go on to massacre civilians in village X. 2003 is likely to be another grim year for Colombia. Hard-line President Uribe continues to act on his belief that "only bullets will win this war," declaring a state of emergency but failing to reclaim significant amounts of guerrilla-held territory. [105 ] The guerrillas remain far from renewed peace talks. The FARC, its hard-line leaders increasing the group’s military savagery and political isolation, has increased its share of killings and its ability to operate in urban areas. The paramilitaries, seeking negotiations with a president whom its leaders profess to admire, continue their systematic violence against labor leaders, human rights defenders, journalists and other non-violent reformers. Meanwhile, as their bosses focus their attentions on other parts of the world, mid-level State and Defense Department officials are putting the finishing touches on their 2004 aid request to Congress. These officials – and the members of Congress who must consider their proposed strategy – would do well to heed a piece of advice attributed to Will Rogers: "If you find yourself in a hole, the first thing to do is stop digging." The drug war has so far failed to yield a shred of progress in Colombia. It is unlikely that success lies in adding a second war (on terrorism) – with a special emphasis on helping a U.S. oil company – while lesser amounts of economic assistance lag behind. "The United States shares Colombia’s vision of a prosperous democracy, free from the scourges of narcotics and terrorism, which respects human rights and the rule of law," reads a December 2002 State Department report. [106 ] It is impossible to realize this vision, however, with a strategy that overwhelmingly favors the armed, repressive part of Colombia’s state. Security, of course, is of crucial importance, but it is achieved through neither helicopters nor a focus on drugs and oil pipelines. In order to achieve true security, decreased drug production and the demobilization of armed groups, the Center for International Policy recommends the following changes to U.S. policy in Colombia. • Recognize that "security" is more than a military goal. "We can’t have alternative development," Deputy Secretary of State Richard Armitage told a Senate caucus in September 2002, "until we’ve gotten a much better security system. "[107 ] The deputy secretary articulates a widespread but misguided belief that military and economic aid must occur sequentially, one before the other. In practice, efforts to address the root causes of the conflict cannot wait until some future moment when "security conditions" are considered to exist. A soldier can be stationed every few square feet in a zone – but the zone still won’t be secure while the population is hungry, distrustful of the state, and courted by armed groups. The United States should recall the dictates of its own counter-insurgency doctrine, which emphasizes the importance of winning the population’s "hearts and minds." This means that spending for basic needs in Colombia must increase dramatically (easily done by cutting high-cost military-aid initiatives) and speed up significantly. It makes no sense to avoid assisting populations in conflictive or isolated areas – these are the zones where governance most needs to be strengthened. • Abandon fumigation in favor of an eradication strategy that actually strengthens the Colombian government. A government that expects to control its territory cannot enforce its laws anonymously, from a spray plane. Few Colombian coca-growers have had significant contact with their government, which they associate only with military patrols and herbicides. Achieving a lasting drop in illicit coca cultivation will require government representatives to be present in drug-cultivation zones, explaining to coca-growers face to face that their illegal activity must cease and that alternatives are available. Without such regular contact, the most systematic, efficient fumigation effort imaginable would still be tantamount to counter-insurgency in reverse, creating new support for illegal armed groups and encouraging coca-growers to set up elsewhere in Colombia’s vast untouched wilderness. Nonetheless, at present the U.S. and Colombian governments are immovably committed to expanded fumigation. This raises a more immediate humanitarian issue: spraying must at least be accompanied with emergency food assistance for coca-growing families whose means of subsistence has been destroyed. Starving people is neither a moral nor an effective eradication strategy. The governors of Tolima, Cauca, Nariño and Putumayo have developed detailed plans for developing and pacifying their departments, but lack funding to carry them out. • Let local populations take the lead in their own development and security. Washington and Bogotá will not succeed if they dictate social reforms, changes in agrarian policy, or security decisionmaking to affected populations. Instead of paternalistic handouts like the failed "social pacts," the government should follow the lead of governors and mayors, peasant organizations, producer federations, indigenous organizations and others who understand their communities’ challenges and needs. Ideas for local alternatives abound throughout Colombia, from the detailed proposals issued by governors in southern Colombia to the "life plans" of indigenous cabildos. Some U.S.-funded programs, such as efforts to strengthen municipal governments in southwest Colombia or the revamped USAID program in Putumayo, are making some effort to build local capacities. These efforts are small, however, reaching only a minuscule fraction of those affected by rural Colombia’s violence and economic collapse, and should be significantly expanded. • Increase third countries’ involvement and assistance. Helping Colombia out of its multiple crises calls for more than bilateral cooperation. Yet most European donors and Colombia’s neighbors have distanced themselves from the United States’ military-dominated strategy. Other donors must be brought into the design and implementation of a common, coordinated assistance effort. This would require U.S. officials to yield on occasion to the priorities of European donors and democratically elected Andean neighbors. • Reduce and reorient security assistance to help Colombia’s government make security a "public good." Deliver such aid transparently and subject it to strict human rights standards. Aiding Colombia’s military and police is a potentially dangerous undertaking. The United States’ often tragic history of security assistance to Latin America is well documented, while the Colombian military’s historic role has been to protect the interests of a powerful few, often against non-violent opponents. Nonetheless, Colombia’s civilian population faces immediate threats from illegal armed groups, and it is the state’s job to protect them. Colombia and its security forces must break radically with past patterns and make security a public good – available to all, even the poor, the powerless, and the opposition. This goal does not guide current U.S. aid to Colombia; instead of protecting the weak, our assistance protects spray planes and oil pipelines. U.S. security assistance must be decreased and reoriented toward helping Colombia’s security forces fulfill their long-neglected responsibility to the country’s most vulnerable citizens. As the past has shown, without extreme vigilance even this aid can end up fortifying Colombia’s unjust order and worsening the human rights climate. Any military aid to Colombia must therefore be provided in a very transparent way – detailed information about assistance must be freely available to both countries’ citizens – and subject to rigorous human rights conditions forcing a cutoff if human rights violations go unpunished. • Make further assistance contingent on Colombia paying a greater share. Colombia is simply too big for the United States to come to its rescue. Whether military or economic in nature, U.S. assistance will have only marginal impact if not accompanied by a significant increase in Colombians’ own contribution. This will require privileged Colombians to undergo deep sacrifices, which would be another major break with the past. • View security and human rights as inseparable and mutually reinforcing. Human-rights priorities must be central to all U.S. assistance. This means consistently enforcing human rights law, interpreted strictly ("complying" should mean "fully complying," not "sometimes complying"). Human rights measures should be seen as a useful tool for encouraging action against paramilitary groups and for ending the impunity that allows so much abuse and corruption to continue. Making human rights a central priority means taking a strong and vocal stand on behalf of threatened human rights defenders, union leaders, journalists and other non-violent reformers – even if they criticize U.S. policy. Washington must not offer unqualified, blanket support for President Uribe’s security initiatives, several of which risk endangering civilians by placing them in the midst of conflict. • Keep the troop cap and restrictions on U.S. personnel in combat. Pressure to change the U.S. presence in Colombia, such as an increase in the troop cap or a deployment of U.S. advisors to accompany combat operations, would be a signal that Washington is crossing a dangerous threshold. Existing limits on U.S. personnel in Colombia – whether in the law or as a matter of policy – should be preserved. • Invest more on drug treatment. Studies have demonstrated that increasing addicts’ access to treatment programs at home is more cost-effective than interdiction and eradication abroad. Though the Clinton and Bush administrations have raised the treatment budget since the mid-1990s, far too many addicts cannot enter programs for lack of funds. A significant reduction in demand at home would mean much less money for guerrilla and paramilitary weapons and abuses. The Center for International Policy shares this analysis, which we note makes no mention of oil pipelines or "narco-terrorism." A genuine U.S. and Colombian effort to address these "deeply-rooted problems" would be a radical break with historic patterns and policies, more revolutionary than anything Colombia’s insurgents claim to be fighting for. United States Congress, Conference Report 106-710 on Public Law 106-246 (Washington: Library of Congress: June 29, 2000) <http://frwebgate.access.gpo.gov/cgi-bin/getdoc.cgi?dbname=106_cong_reports&docid=f:hr710.106.pdf>. United States, White House, Office of National Drug Control Policy, "McCaffrey Praises Senate on Approval of Colombia / Andean Ridge Drug Emergency Assistance Package," Press release (Washington: June 22, 2000) <http://www.ciponline.org/colombia/062215.htm>. United States Senate, Speech by Sen. Paul Wellstone, Congressional Record (Washington: June 21, 2000): S5492 <http://thomas.loc.gov/cgi-bin/query/B?r106:@FIELD(FLD003+s)+@FIELD(DDATE+20000621)>. Jerry Seper, "Drug Czar Rips Clinton, Congress on Funding," The Washington Times (Washington: December 2, 1999): 13. "Plan Colombia: A Plan for Peace, or a Plan for War?" Letter from seventy-three Colombian non-governmental organizations (Bogotá: June 2000) <http://www.ciponline.org/colombia/062001.htm>. These estimates and the table on page 2 are derived from twenty-seven different U.S. government documents, too many to list in this publication. To view a list of sources, visit http://ciponline.org/colombia/aidtable.htm. United States, Department of State, U.S. Embassy Bogotá, "Remarks by Ambassador Anne W. Patterson at the CSIS Conference" (Washington: October 8, 2002) <http://usembassy.state.gov/posts/co1/wwwsa034.shtml>. United States, Department of State, Bureau for International Narcotics and Law Enforcement Affairs, International Narcotics Control Strategy Report (Washington: March 1, 2002) <http://www.state.gov/g/inl/rls/nrcrpt/2001/rpt/8477.htm>. United States Senate, Caucus on International Narcotics Control, "Hearing on U.S. Policy in the Andean Region," Hearing transcript (Washington: September 17, 2002) <http://drugcaucus.senate.gov/hearings_events.htm>. United States, Department of State, Bureau of International Narcotics and Law Enforcement Affairs, Fiscal Year 2003 Budget Congressional Justification (Washington: Department of State: April 2002) <http://www.state.gov/g/inl/rls/rpt/cbj/fy2003/>. United States, White House, Office of Management and Budget, Technical language accompanying FY02 supplemental budget request (Washington: March 21, 2002) <http://www.ciponline.org/colombia/02supp_technicallanguage.pdf>. United States, Department of State, "Daily Briefing with Spokesman Richard Boucher" (Washington: May 10, 2002) <http://www.state.gov/r/pa/prs/dpb/2002/10081.htm>. Bureau of International Narcotics and Law Enforcement Affairs, Fiscal Year 2003 Budget Congressional Justification, April 2002. United States, Department of State, "A Report to Congress on United States Policy Towards Colombia and Other Related Issues" (Washington: December 3, 2002) <http://ciponline.org/colombia/02120302.htm>. Senate Caucus on International Narcotics Control, September 17, 2002. John Walters, director, White House Office of National Drug Control Policy, Press briefing (Washington: August 13, 2002) <http://ciponline.org/colombia/02081301.htm>. United States, Department of State, "Daily Briefing with Spokesman Richard Boucher" (Washington: January 3, 2003) <http://www.state.gov/r/pa/prs/dpb/2003/16359.htm>. United States, Department of State, "Daily Briefing with Spokesman Richard Boucher" (Washington: January 14, 2003) <http://www.state.gov/r/pa/prs/dpb/2003/16641.htm>. United States, Department of State, Department of Defense, Foreign Military Training and DoD Engagement Activities of Interest: Joint Report to Congress (Washington: March 2002) <http://state.gov/t/pm/rls/rpt/fmtrpt/2002/10727.htm>. United States, Department of Defense, Western Hemisphere Institute for Security Cooperation, "Commandant’s Briefing: Western Hemisphere Institute for Security Cooperation: A New Institute for a New Century," (Columbus, GA: August 2002) <http://www.benning.army.mil/whinsec/whinsec_brief/Internet%20brief%2013%20Aug.htm>. Rowan Scarborough, "U.S. law bars giving Colombians data," The Washington Times (Washington: February 26, 2002). Brig. Gen. Galen Jackman, U.S. Southern Command J-3 (Operations), Media roundtable, September 29, 2002 <http://ciponline.org/colombia/02100401.htm>. United States, House of Representatives, Hearing of the House Appropriations Subcommittee on Foreign Operations, Transcript from Federal News Service (Washington: April 10, 2002) <http://www.ciponline.org/colombia/02041003.htm>. United States Senate, Speech by Sen. Richard Durbin, Congressional Record (Washington: June 21, 2000): S5496 <http://thomas.loc.gov/cgi-bin/query/B?r106:@FIELD(FLD003+s)+@FIELD(DDATE+20000621)>. United States Army, United States Air Force, FM 100-20 / AFP 3-20: Military Operations in Low Intensity Conflict (Washington: December 5, 1990): Chapter 2 <http://www.adtdl.army.mil/cgi-bin/atdl.dll/fm/100-20/10020ch2.htm>. U.S. Embassy Bogotá, October 8, 2002. United States Congress, House Appropriations Committee Report 107-663 on H.R. 5410 (Washington: Library of Congress: September 19, 2002): 61 <http://frwebgate.access.gpo.gov/cgi-bin/getdoc.cgi?dbname=107_cong_reports&docid=f:hr663.107.pdf>. Department of State, December 3, 2002. Department of State, International Narcotics Control Strategy Report, March 2002. Gen. Gary D. Speer, acting commander-in-chief, United States Southern Command, Testimony before the House International Relations Subcommittee on the Western Hemisphere, April 11, 2002 <http://ciponline.org/colombia/02041105.htm>. 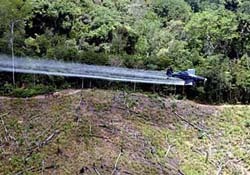 Paul de la Garza and David Adams, "Colombia stymies coca plant spraying," The St. Petersburg Times (St. Petersburg, FL: May 27, 2001) <http://www.sptimes.com/News/052701/Worldandnation/Colombia_stymies_coca.shtml>. United States Congress, General Accounting Office, Efforts to Develop Alternatives to Cultivating Illicit Crops in Colombia Have Made Little Progress and Face Serious Obstacles, GAO-02-291 (Washington: February 2002): 13 <http://www.gao.gov/new.items/d02291.pdf>. Adolfo Franco, assistant administrator, Bureau for Latin America and Caribbean, U.S. Agency for International Development, Testimony before the House Appropriations Subcommittee on Foreign Operations, April 10, 2002 <http://www.usaid.gov/press/spe_test/testimony/2002/ty020410.html>. House Appropriations Subcommittee on Foreign Operations, April 10, 2002. Rachel Van Dongen, "Legal Crops’ Damage," The Washington Times (Washington: October 15, 2002) <http://www.washtimes.com/world/20021015-82149522.htm>. Paul E. Simons, acting assistant secretary of State for International Narcotics and Law Enforcement Affairs, Testimony before the House Committee on Government Reform (Washington: December 12, 2002) <http://usembassy.state.gov/posts/co1/wwwsps01.shtml#English>. Author interview with local leader, name and position withheld for security reasons, Nariño, Colombia, November 1, 2002. United States Senate, Hearing of the Senate Foreign Relations Subcommittee on the Western Hemisphere (Washington: April 24, 2002) <http://ciponline.org/colombia/02042405.htm>. Curt Struble, acting assistant secretary of state for Western Hemisphere Affairs, Response to author inquiry at briefing hosted by International Crisis Group (Washington: January 10, 2003). David B. Sandalow, executive vice president, World Wildlife Federation, Letter to Sen. Joseph Biden (Washington: September 27, 2002) <http://www.amazonalliance.org/scientific/wwf.pdf>. United States, Department of State, Bureau for International Narcotics and Law Enforcement Affairs, "The Government of Colombia’s Procedures for Handling Complaints of Colombian Citizens that Their Health was Harmed or Their Licit Agricultural Crops Were Damaged by Aerial Eradication," Report on Issues Related to the Aerial Eradication of Illicit Coca in Colombia (Washington: September 4, 2002) <http://www.state.gov/g/inl/rls/rpt/aeicc/13242.htm>. 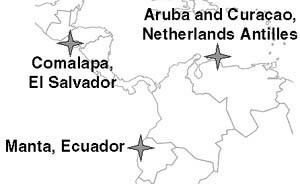 United States, Department of State, Bureau for International Narcotics and Law Enforcement Affairs, "Aerial Eradication and Alternative Development," Report on Issues Related to the Aerial Eradication of Illicit Coca in Colombia (Washington: September 4, 2002) <http://www.state.gov/g/inl/rls/rpt/aeicc/13245.htm>. Lisa Haugaard, executive director, Latin America Working Group, "Analysis of Compensation and Alternative Development Sections of State Department’s ‘Report on Issues Related to the Aerial Eradication of Illicit Coca in Colombia’" (Washington: September 16, 2002) <http://www.amazonalliance.org/scientific/comments.pdf>. United States, Department of State, "Colombia," Country Reports on Human Rights Practices – 2001 (Washington: March 4, 2002) <http://www.state.gov/g/drl/rls/hrrpt/2001/wha/8326.htm>. United States, Department of State, "Memorandum of Justification Concerning Human Rights Conditions with Respect to Assistance for Colombian Armed Forces" (Washington: September 9, 2002) <http://ciponline.org/colombia/02090902.htm>. Amnesty International, Human Rights Watch, Washington Office on Latin America, "Colombia Human Rights Certification IV" (Washington: September 2002) <http://www.amnestyusa.org/countries/colombia/reports/colombia-certification-IV.pdf>. Sen. Patrick Leahy, "Comment of Senator Patrick Leahy on the Secretary of State’s certification on September 9, 2002," Press release (Washington: September 10, 2002) <http://leahy.senate.gov/press/200209/091002a.html>. United States, White House, Office of the Press Secretary, "President’s Letter to Congress on U.S. Personnel in Colombia" (Washington: January 13, 2003) <http://www.whitehouse.gov/news/releases/2003/01/20030114-11.html>. Senate Foreign Relations Subcommittee on the Western Hemisphere, April 24, 2002. T. Christian Miller, "Foreign Pilots Hired to Boost U.S. Drug War" The Los Angeles Times (Los Angeles, August 18, 2001). United States Senate, Senate Appropriations Committee Report 107-219 on S. 2779 (Washington: Library of Congress: July 24, 2002) <ftp://ftp.loc.gov/pub/thomas/cp107/sr219.txt>. United States, White House, Office of National Drug Control Policy, "Coca Cultivation in Colombia, 2001," Press Release (Washington: March 7, 2002) <http://www.whitehousedrugpolicy.gov/news/press02/030702.html>. Government of Colombia, Ministry of Justice, Press release (Bogotá: February 27, 2002) <http://ciponline.org/colombia/02022702.htm>. Government of Colombia, Dirección Nacional de Estupefacientes, La lucha de Colombia contra las drogas ilícitas - Acciones y resultados 1999-2000 (Bogotá: DNE, 2001): 2. United Nations Drug Control Program, Colombian government National Narcotics Directorate, Colombian National Police Anti-Narcotics Division, "Localización de Areas con Cultivos de Coca, Proyecto SIMCI, Censo Noviembre 01 de 2001," (Bogotá: SIMCI project, 2001) <http://ciponline.org/colombia/2002map.jpg>. United States, Department of State, Bureau for International Narcotics and Law Enforcement Affairs, International Narcotics Control Strategy Report (Washington: March 1999) <http://www.state.gov/www/global/narcotics_law/1998_narc_report/major/Colombia.html>. 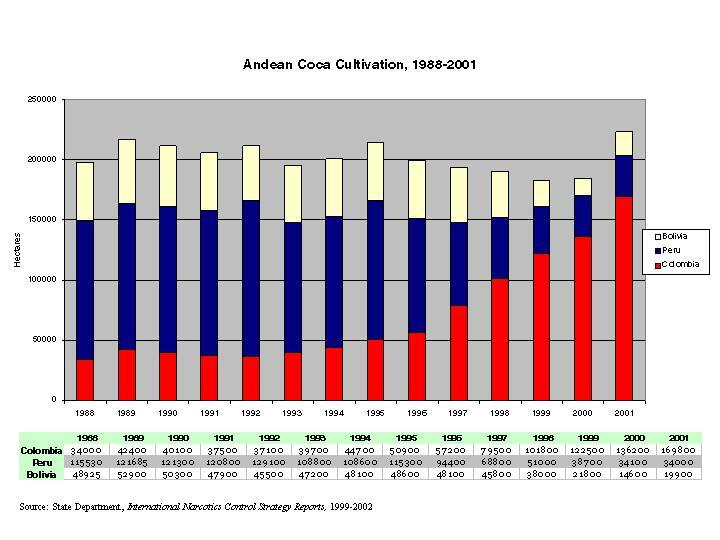 Office of National Drug Control Policy, "Coca Cultivation in Colombia, 2001." United States, White House, Office of National Drug Control Policy, "Table 33: Average Price and Purity of Cocaine and Heroin in the United States, 1981–2000," National Drug Control Strategy: 2002 (Washington: January 2002) <http://www.whitehousedrugpolicy.gov/publications/policy/03ndcs/table33.html>. "¿Contra Quién es la Guerra?" CODHES Informa 43 (Bogotá: CODHES, November 18, 2002) <http://www.codhes.org.co/boletin_public/boletin_ult.htm>. Gustavo Gallón Giraldo, "Esta Guerra No Se Gana a Bala" (Bogotá: Comisión Colombiana de Juristas, September 4, 2002) <http://ciponline.org/colombia/0212ccj.pdf>. 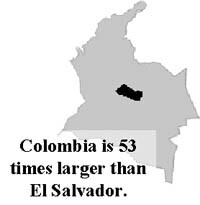 "Colombia," World Report 2003 (New York: Human Rights Watch, January 2003) <http://www.hrw.org/wr2k3/americas4.html>. Gen. Barry R. McCaffrey, director, Office of National Drug Control Policy, "Remarks to the Atlantic Council of the United States" (Washington: November 28, 2000) <http://www.ciponline.org/colombia/112801.htm>. Gen. McCaffrey clearly felt differently in private. In June 2002, the former drug czar told National Journal, "There was always an artificiality to this policy that endorsed helping a democratically elected Colombian government against drug criminals but refused to help them when they are threatened by people who are blowing up oil pipelines, murdering mayors, and kidnapping politicians. It was almost an out-of-body experience going through these mental contortions, deciding what intelligence we could share with Colombians whose lives were often in danger. Sometimes I wanted to ask, What was Washington thinking?" Cited in United States Senate, Foreign Relations Committee, "Trip Report: Minority Staff Delegation to Colombia, May 27-31, 2002," (Washington: June 2002) <http://ciponline.org/colombia/02053101.pdf>. Peter Rodman, assistant secretary of defense for International Security Affairs, Media roundtable (Washington: August 21, 2001) <http://www.defenselink.mil/news/Aug2001/t08222001_t0821asd.html>. Rui Ferreira, "Las FARC se asemejan a Bin Laden," El Nuevo Herald (Miami: September 29, 2001). Ambassador Francis X. Taylor, State Department coordinator for counterterrorism, Press conference at the OAS (Washington: October 15, 2001) <http://www.oas.org/OASpage/eng/videos/pressconference10_15_01.asf>. Anne Patterson, U.S. ambassador to Colombia, Speech (Bogotá: October 25, 2001) <http://ciponline.org/colombia/102501.htm>. Jonathan Wright, "Powell Sees ‘Gray Areas’ in Defining Terrorism", Reuters (Washington: October 25, 2001). Anthony Boadle, "Pastrana Seeks U.S. Aid to Fight ‘Narco-Terrorism,’" Reuters (Washington: November 9, 2001). George Tenet, director of central intelligence, Testimony before the Senate Select Committee on Intelligence (Washington: February 6, 2002) <http://www.cia.gov/cia/public_affairs/speeches/dci_speech_02062002.html>. Rep. Cass Ballenger, Statement at hearing of the House International Relations Subcommittee on the Western Hemisphere (Washington: April 11, 2002) <http://www.house.gov/international_relations/ball0411.htm>. Rep. Henry Hyde, Statement at hearing of the House International Relations Committee (Washington: April 24, 2002) <http://www.house.gov/international_relations/hyde0424.htm>. United States, House of Representatives, H.Res. 358 (Washington: March 6, 2002) <http://thomas.loc.gov/cgi-bin/query/z?c107:H.RES.358:>. 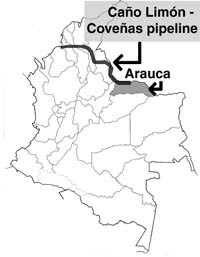 United States, Department of State, "Report to Congress: Caño Limón Pipeline" (Washington: December 2002) <http://ciponline.org/colombia/02120001.htm>. United States House of Representatives, Speech by Rep. Mark Souder, Congressional Record (Washington: May 23, 2002): H3001 <http://thomas.loc.gov/cgi-bin/query/B?r107:@FIELD(FLD003+h)+@FIELD(DDATE+20020523)>. Gen. Gary D. Speer, acting commander-in-chief, United States Southern Command, Testimony before the Senate Foreign Relations Subcommittee on the Western Hemisphere, April 24, 2002 <http://usinfo.state.gov/regional/ar/colombia/02042404.htm>. Clara Inés Rueda G., "E.U. cuidará intereses petroleros en Colombia, dice embajadora," El Tiempo (Bogotá: February 10, 2002) <http://ciponline.org/colombia/02021001.htm>. United States House of Representatives, Speech by Rep. Gene Taylor, Congressional Record (Washington: May 23, 2002): H3008 <http://thomas.loc.gov/cgi-bin/query/B?r107:@FIELD(FLD003+h)+@FIELD(DDATE+20020523)>. Vanessa Arrington, "U.S. 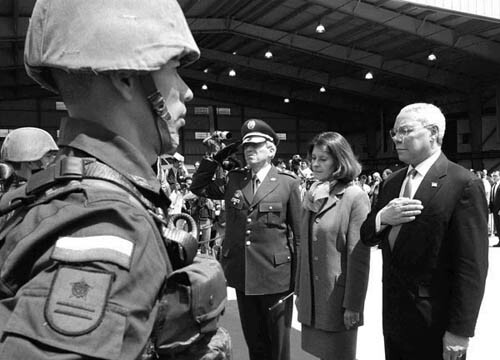 Envoy Greets Forces in Colombia," Associated Press (Bogotá: January 17, 2002) <http://story.news.yahoo.com/news?tmpl=story&u=/ap/20030118/ap_on_re_la_am_ca/colombia_us_troops_7>. United States Congress, Public Law No: 107-206 (Washington: August 2, 2002) <http://thomas.loc.gov/cgi-bin/query/z?c107:H.R.4775.ENR:>. United States House of Representatives, Speech by Rep. Ike Skelton, Congressional Record (Washington: May 23, 2002): H2998 <http://thomas.loc.gov/cgi-bin/query/B?r107:@FIELD(FLD003+h)+@FIELD(DDATE+20020523)>. United States House of Representatives, Speech by Rep. Jim McGovern, Congressional Record (Washington: May 23, 2002): H2997 <http://thomas.loc.gov/cgi-bin/query/B?r107:@FIELD(FLD003+h)+@FIELD(DDATE+20020523)>. Kim Burger, "US Special Forces Give Colombians Anti-Terrorism Training," Jane’s Defence Weekly (London: January 8, 2003). Ambassador Marc Grossman, under secretary of state for Political Affairs, Testimony before the Senate Foreign Relations Subcommittee for Western Hemisphere Affairs (Washington: April 24, 2002) <http://usinfo.state.gov/regional/ar/colombia/02042403.htm>. U.S. Embassy Bogotá, "Palabras de la Embajadora Anne W. Patterson ante la conferencia ‘Colombia a los ojos de Wall Street’" (Bogotá: July 25, 2002) <http://usembassy.state.gov/posts/co1/wwwsa030.shtml>. U.S. Embassy Bogotá, "Discurso de la Embajadora Anne W. Patterson ante Fedegán" (Cartagena: November 21, 2002) <http://usembassy.state.gov/posts/co1/wwwsa037.shtml>. Off-the-record interviews with U.S. officials with security responsibilities, June and August 2002. Andres Calá, "Danger of a New Vietnam," The Gazette (Montreal: February 9, 2001) <http://www.thirdworldtraveler.com/Drug_War/DangerNewVietnam.html>. Peter Rodman, assistant secretary of defense for International Security Affairs, Testimony before the Senate Foreign Relations Subcommittee on the Western Hemisphere, April 24, 2002 <http://usinfo.state.gov/regional/ar/colombia/02042402.htm>. © Copyright 2003 by the Center for International Policy. All rights reserved. Any material herein may be quoted without permission, with credit to the Center for International Policy.